30 Days of Coffee: Day 14 | Eat. Go. Learn. Live. Between Silverlake and Griffith Park, there’s a small neighborhood called Los Feliz. In Los Feliz there are tons of shops and restaurants catering to every desire you can think of. One of my favorite spots for coffee there is H Coffee. It’s attached to Home, which is an awesome place to go for breakfast (and probably other meals too, but I’ve only ever been in the morning hours) so try ’em both out! The coffee at H Coffee is from Counter Culture. Their standard coffee drinks are pretty consistent, as well as their selection of teas. All of their flavored syrups are made in-house too. They have a seasonal drink menu for both coffee drinker and non-coffee drinkers. The pastries here are made by Sugar Bloom, who also sources some of the other coffee spots in this list (Demitasse and Blue Bottle). Their artisan breads come from Bread LA. They also offer a few items made on location like empanadas and frittatas. What I love most about H Coffee is the decor. The space is in a converted house, and there are a few different rooms to chill out in. There is a fireplace in the main room as well as a couple booths, a bar table and some cozy chairs. The patio is pretty intimate, but quite charming as well. It’s really nice to visit on a warm night and sit outside for some coffee talk. 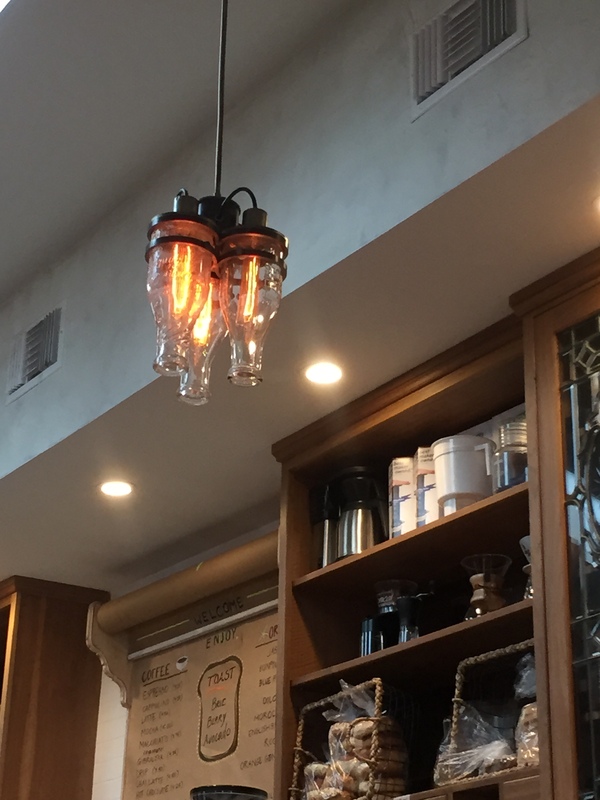 I especially like the light fixtures made from everyday objects like bottles and teacups! It’s really an adorable space that you have to see for yourself! I love that there’s a globe! 30 Days of Coffee: Day 24 | Eat. Go. Learn. Live.